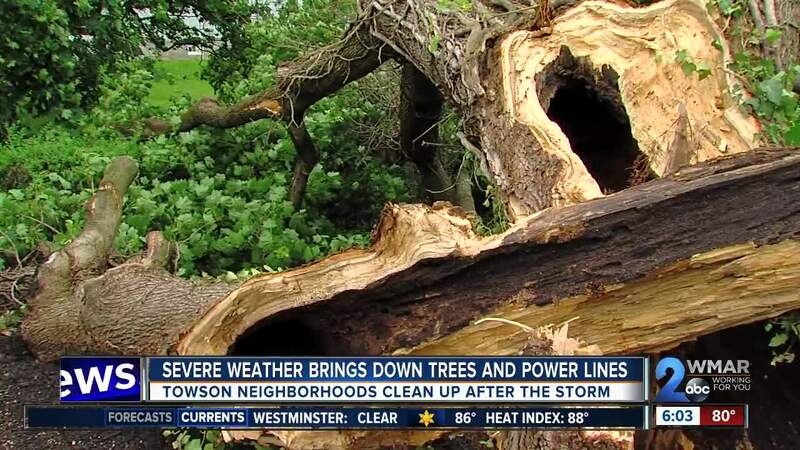 People in Towson are dealing with road closures, downed trees and power lines after Monday's sudden storm. Navigating West Joppa Road is like driving through a labyrinth while BGE crews work to remove massive trees supported only by power lines. Many neighbors remember the fleeting storm lasting only around ten minutes, but it packed a punch. "I watched these trees, and we have some really big trees, and I watched these trees blown and literally bending over," said Caroline Bordley. Bordley has lived in the Towson neighborhood 25 years. She's seen storms during that time, so when she didn't immediately lose power or have a tree fall on her roof, she thought they made it through unscathed. Until a utility pole a few blocks up came crashing down taking the electricity with it. “It flickered, it literally came on and off and then at 7:30 it just went pow, and that was it and the storm was over with,” said Bordley. And yet, she's surprisingly upbeat for someone without air conditioning in this oppressive heat. “Rags around the neck. That works. Cold water and rags around the neck,” Bordley said. On the same road, a few blocks west, there was far more destruction. A large tree crushed a shed, pinning a car inside. George Lopez, with a local tree service, was on top of the house next door, chipping away. "We still got couple more jobs in the neighborhood and we got a lot of tree damage everywhere," Lopez said. He estimates this one job may take two days or more. And around the corner, is where Elizabeth Mazhari lives. "The rain was just coming sideways, it was swirling all of a sudden," said Mazhari. "I called for the girls to come downstairs because I was afraid we'd lose a tree, and we did." She said a neighbor saw the tree in her front yard get struck by lightning. "That's what I think brought it down. You can see some charred pieces here," Mazhari said. "We just heard one pop and the tree was down." To search for a licensed tree expert in the state, click here . BGE also has a map that details power outages. You can zoom in and see the estimated time power will be restored. Click here to view the outage map.